STRUBLE, Iowa – Computers are everywhere these days, doing things that would have amazed even Buck Rogers. Many of these computerized tasks take place behind the scenes, while others – such as helping a corn planter scribe laser-straight rows – are much more visible. Perhaps one of the best examples of labor-saving, computer-driven technology can be seen at Dykstra Dairy’s new calf raising facility. Dykstra Dairy, which is owned by Darin Dykstra and his family, is home to 3,000 head of milk cows. Until recently, Dykstra Dairy used the services of a heifer raiser to rear their replacement heifers. As of this past Dec. 15, that all changed. Computer technology has made it possible for Dykstra Dairy to raise all their own heifer calves, using the labor of just two people. “Darin decided that his death loss was too great at his heifer raiser so he decided to take control of the heifer raising process,” said Karl Bos, manager of Dykstra Dairy’s new heifer ranch. Dykstra Dairy’s heifer ranch started out as a bare site. A multiplex of buildings were erected on their site over this past summer, including a shop, a commodity shed, and three 1,100-foot long open front buildings to house growing heifers. Perhaps the most remarkable structures are a pair of 288-foot long sheds that shelter their baby calves. What makes them notable is the fact that each of these two buildings contains seven computerized automatic calf feeders. “We had previously installed several automatic calf feeders, but they were all retrofits,” said Ed Herbst, General Manager of Sioux Dairy Equipment, the Rock Valley, Iowa firm that built and helped design Dykstra Dairy’s heifer ranch. “It was fun to work on a facility that was expressly designed for automatic calf feeders,” said Herbst. Calves are born at Dykstra Dairy’s main dairy facility. After being fed their first meal of colostrum, the calves are taken to the heifer ranch. The calves are put in pens with other calves their age. Most new arrivals must be taken to the automatic feeder a few times before they catch onto the system. Once they get the hang of being fed by a robot, the calves are free to visit the feeder as often as they like. 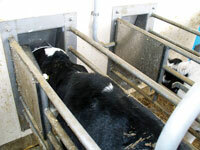 An RFID system identifies each calf as it enters the feeder. The feeder’s computer then determines if the calf is eligible to be fed and doles out a predetermined amount of freshly mixed milk replacer. Bos has learned that a lower concentration of milk replacer can be fed to bull calves compared to what is given to the heifers. Bull calves are currently sold at 60 days. After weaning, the heifer calves are moved into one of the three open front sheds. The heifers will remain at the Dykstra Dairy heifer ranch until they are 180 days pregnant. Having computerized machines performing the task of feeding calves doesn’t mean the end of human contact with the baby bovines. Bos, who grew up on a 120-cow dairy farm in Lyndon, Washington, likes the social aspect of housing the calves in groups. The 14 robotic calf feeders on the Dykstra calf ranch have been turning in solid performances. Baby calves are offered a custom-blended calf starter as soon as they arrive. 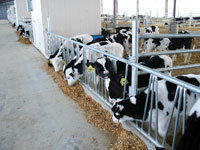 Dykstra Dairy made the decision to install training panels in their baby calf pens. These training panels have V-shaped openings that are very similar to the configuration of a headlock. Bos beds the baby calves with straw at least once per week, more often if needed. Calves remain together in the same pen until they are weaned. The pen is then emptied, cleaned, power washed, and sterilized with lime. On a chilly February afternoon, Bos watches as a pen of baby calves frisk about in a deep layer of fresh straw. Even though their “mother” is a machine, it appears that the calves think it’s pretty nice too.